but conservationists are hoping to topple them once and for all. Riggins, Idaho, population 410, is a scenic town, hugging a turn in the Salmon River. The river, locals say, was once so full of Chinook salmon that people joked you could cross it on their backs. During spawning season, "they made such a racket that you couldn't sleep at night," says Rexann Zimmerman, the 59-year-old owner of the Hook, Line, and Sinker tackle and liquor store. "Now they're something rare and precious." The Columbia River Basin, encompassing parts of Washington, Montana, Idaho, and Oregon, was once home to more Chinook salmon than any other place in the world, with numbers ranging from 8 million to 15 million fish a year. Today the Basin population is around 2 million. While overfishing and habitat destruction are partly to blame, the most significant threat, by far, to the salmon in the Pacific Northwest is the region's government-built hydroelectric dams, which choke the passage of juvenile fish on their way to the Pacific Ocean. Turbines, over-the-dam plunges, and the stress placed on salmon as they navigate hundreds of miles of slack water have resulted in the loss of approximately half of each year's outbound population, not to mention millions of dollars in revenue from a once-thriving sport- and commercial-fishing industry in small towns like Riggins. Conservationists and the government both recognize the damage the dams have done to the salmon population but are at odds over what should be done about it. Last August a U.S. district judge in Portland ruled -- for the third time in a decade -- that government efforts to restore the salmon population through mitigation programs like hatcheries were not only insufficient but also in violation of the Environmental Species Act (ESA). But it was a hollow victory. While the federal government must come up with new repopulation projects to run through 2018, it once again sidestepped what conservationists call the only viable solution: dam removal. Dam construction in the Basin dates to the 1930s, when the Army Corps of Engineers began erecting them to exploit the hydroelectric capacity of the area's rivers. There are currently more than 400 dams throughout the region, lighting the homes of local residents, powering regional utilities and industries, and creating navigable shipping waterways that eliminate hundreds of miles of slow and expensive overland travel for U.S. goods en route to the Pacific. On the Lower Snake River -- the Columbia River's largest tributary -- four dams in particular, built between 1961 and 1975, have had a devastating effect on the salmon population. 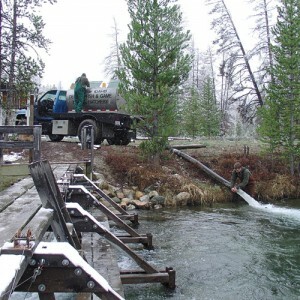 They block the path to 2.4 million acres of pristine spawning grounds in a wilderness preserve in central Idaho. Largely because of those dams, the federal government had to put the Snake River's sockeye salmon on the endangered species list in 1991. Since then, 12 more runs of salmon in the Basin have been recognized as endangered or near extinction. Conservationists have fought to prevent the loss of this keystone species, which brings ocean nutrients hundreds of miles inland, feeding plants, insects, animals, forests, and, yes, human beings. "When salmon decline, rivers and lakes become sterile, and that's what's happening in Idaho," says Bert Bowler, a former Idaho Department of Fish and Game biologist. "You can cut trees and replant them. But once these fish are gone, they're gone." Advocates like Bowler, as well as the National Wildlife Federation and the Sierra Club, have called for the removal of the four dams on the Snake. "The government is trying hard to convince people that the dams are not a problem," says Tom Stuart, a longtime fisherman and salmon-recovery activist with Idaho Rivers United. "Of course, common sense and the best available science tell us it's a huge problem." "The largest swath of wild country in the Lower 48 is supposed to be teeming with wild salmon," says Steven Hawley, a professional river guide and the author of Recovering a Lost River. "But it isn't. The culprit is these gargantuan dams." In a warehouse 150 miles south of Riggins, just outside of Boise, a bearded man in rubber overalls is hard at work "masturbating" a salmon. He's just plucked the four-year-old sockeye from a Coleman cooler full of anesthetizing tricaine methane sulfonate at the Eagle Fish Hatchery. After the man jackknifes the fish over his thigh, he pinches its red belly, running his fingers toward its "vent." The salmon squirts its sperm onto the industrial rubber matting on the concrete floor. "He's running," the man says. The process of getting a fish to ejaculate is called "stripping" or, more colloquially, "milting." The male's sperm will be poured into plastic bags of unfertilized eggs that have been cut from a female's belly, and then incubated in trays circulating with artesian-well water. Each tray will eventually yield some 800 salmon. When the fish reach the one-and-a-half-year-old smolt stage, they are released into the wild. Some migrate 500 miles west to the Pacific. Some are eaten by whales; others are caught by commercial fishermen and wind up on your plate. A select few survive long enough to feel the tug of nature and begin an epic journey 900 miles inland, up 6,500 vertical feet of alpine rivers, to spawn in the same riverbeds where their wild ancestors were born. There are about 200 state, tribal, and federally funded hatcheries in the Columbia Basin, each one built to compensate for damage caused by the hydroelectric dams. Many are mandated by the National Oceanic and Atmospheric Administration (NOAA). In fact, the 1973 Environmental Species Act requires that if a federal agency's project jeopardizes an endangered or threatened species, or threatens its recovery in the wild, the government must provide alternatives to sustain the population and allow it to grow. So in the past decade alone, the U.S. has spent about $11 billion on recovery, in ways both logical and bizarre: counting migrating salmon through a window in a dam, injecting transponder chips into fish noses to track them, placing GPS systems in riverbeds that tell scientists how many fish swim by each day, hauling smolts downriver in barges to avoid the dams, and using sluices to shoot others away from the treacherous turbines. 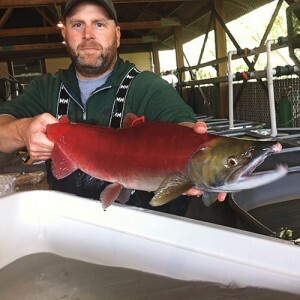 Hatcheries have proved very effective and are, undoubtedly, the only things keeping sockeye salmon from going extinct. But they also pose a problem. Conservationists argue that hatcheries only stem the decline of the salmon and do nothing to bring the numbers to the sustainable levels required by federal law. What's more, they contend, the hatcheries are used as an excuse by the government to avoid taking the necessary and bolder step of dam removal, which would allow the salmon to mate on their own and reach self-sustaining populations. "The government's strategy is to make more fish," says Bowler, who worked at Idaho Fish and Game for 29 years and maintains a nonprofit called Snake River Salmon Solutions. "They will not recover without [the government] dealing with the mortality factor -- the dams." Salmon advocates say the government's $600 million annual price tag for recovery efforts is a taxpayer boondoggle designed to protect the special business interests benefiting from the dams: oil companies that barge mining equipment on their reservoirs; 37,000 acres of farmland that rely on diverted water; and industries that get cheap, federally subsidized electricity. In 2000, a coalition of environmentalists and fishing groups, led by the National Wildlife Federation and joined by the state of Oregon and the region's largest tribe, the Nez Perce, sued NOAA and the Army Corps of Engineers over their salmon-recovery plan and won. They won again in 2005 and again last August. Despite NOAA's refusal to seriously consider dam removal, pressure is mounting as salmon flood back into areas where dams have come down. Between 2006 and 2010, some 241 U.S. dams were demolished, thanks largely to pressure from Native American tribes and conservationists. Many were in the East and Midwest, where their role in powering long-shuttered paper and textile mills made them obsolete. In many cases, fish stocks have started to recover. After a three-decade fight, the federal government finally deemed it necessary to remove two Western dams, on the Elwha River in Washington. Experts believe the area's estimated current salmon population of 3,000 could eventually recover to 300,000. And that's nothing compared to the rebound salmon could see if the four Snake River dams are removed, say conservationists. Salmon there could see their numbers rise from 200,000 to several million. Towns like Riggins could experience a similar rebound. Its main street of clapboard cafes, rafting outfitters, and hotels is, like the salmon, kept barely alive by a nearby fish hatchery. A return of the wild run would bring back the tourists and, says one study, more than $200 million in added revenue. "Dams are always thought of as progress and jobs," says Kerry Brennan, a 59-year-old fishing guide in Riggins, who has spent his entire life on the river. "That's how they got them in in the first place. But now they're killing the fish, and they're killing towns like this. That ain't right."